The ruble fell the most in nine years against the euro this week after the central bank widened its trading band twice and allowed the currency to fall by a further 3.8 percent, following last week's 1 percent devaluation. The currency retreated to a maximum of 5.8 percent over the week, although it recovered somewhat and was up 0.1 percent again today (Friday) over yesterday, trading at 39.1772 per euro at midday in Moscow. The currency has now fallen 16 percent against the dollar since the start of August, and added another 1.3 percent to its losses today, hitting 27.8412 per dollar and falling 1.1 percent (to 33.1020) against the currency basket which is targeted. The ruble thus lost 3.9 percent to the basket this week, in the process experiencing its sixth weekly drop. Russia’s currency reserves fell $1.6 billion to $435.4 billion during the week to 12 December. When compared with the drop of $17.9 billion the week before you could reach the conclusion that the rate of outflow was steadying up, but this does not seem to be the case, since the size of the drop is largely a by-product of the valuation effect produced by the change in the USD-Euro cross, since we need to remember that euro, which constitutes around 44 percent of the reserves, was up 5.1 percent against the dollar during the week. The pound also gained 1.8 percent against the dollar. Hence the dollar value of the euro and pound sterling holdings (about another ten percent of the basket) were up. Vladimir Osakovsky, an economist in Moscow at UniCredit has done some calculations, and he estimates that Russia's central bank probably sold about $12.5 billion in foreign currency last week. Chris Weafer, chief strategist at Moscow bank UralSib, comes up with a similar estimate, and suggests the bank probably sold about $11.5 billion to counter the ruble’s slide, given that the euro component of the reserves increased in value by about $10 billion. (Actually, anyone interested in the somewhat ironic dimension of having so much analysis of Russia's crisis from economists at Unicredit Moscow, while back in Italy the bank's shares are currently falling mightily on a Merrill Lynch downgrade due to their Eastern Europe exposure, may be interested to read this post of mine). 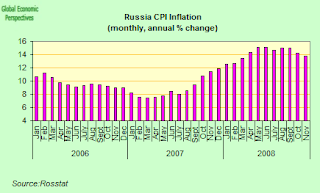 So the ruble is falling and the reserves are flowing out at a rather fast rate, but this is not producing inflation in Russia - in fact quite the contrary, disinflation is very strong in Russia right now, and indeed if things continue at this rate (especially given the sharp contraction in internal demand) deflation and not inflation is going to be the big headache. 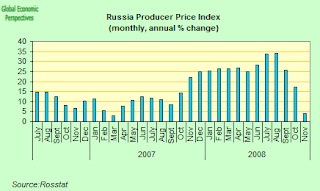 Some evidence to indicate this danger can be found in the fact that Russian producer prices - which are widely regarded as an early indicator of forthcoming inflation - fell sharply again in November, pushing the annual rate to its slowest pace since March 2007 as demand for material for industrial production weakened rapidly. The cost of goods leaving Russian factories and mines fell 8.4 percent between October and November, while the year on year rate of increase dropped to 4.2 percent, according to data out today (Friday) from Rostat. 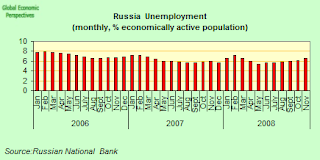 This compares with 17.4 percent y-o-y rate in October, the Federal Statistics Service in Moscow said today. The November fall follows a 6.6 percent monthly drop in October, and it is clear that the rate of disinflation in producer prices is extraordinarily rapid, and it may be that we will soon enter outright price deflation. 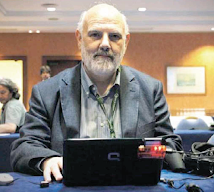 The biggest difficulty is the almost complete lack of control by anyone in authority and the with tecnical expertise to adequately handle macro economic management, whether on the upside or the downside. This is quite simply all terribly dramatic. Consumer price inflation is also slowing, and was down to 13.8% in November, from 14.2% in October. Russia's consumer price inflation rate was running at 0.1 percent in the week between December 9 and 15, according to the Federal State Statistics Service. Inflation was thus 0.3 percent for the month to date and 12.9 percent for the year to date, compared to 0.7 percent and 11.4 percent in the same periods in 2007. So disinflation is already well at work even in consumer prices. Still, these are very - unacceptably - high numbers, and those who so willingly acquiesced in them earlier will now feel the downside of their negligence, although unfortunately it is - as ever - the poor old Russian in the street who will really pick up the bill. More evidence for the rapid velocity of the economic slowdown is provided by the index of key economic activities, which has fallen back from a year on year high of 10.7% in April to a 2008 low of 2.6% year on year in October. This would seem to indicate that the economy may well have been contracting month on month between September and October, although as with much of the data which follows we do not have a lot of systematic access to direct month on month comparisons to be able to closely scrutinise what is happening. 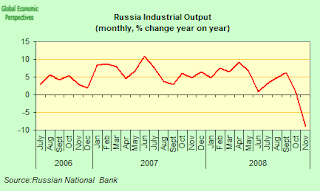 Another short term measure we have - industrial production, which is responsible for about 40 percent of Russian GDP - contracted at a year on year rate of 8.7 percent in November, the fastest rate since the 1998 financial collapse. 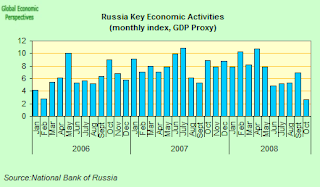 As a result Russia’s Economy Minstry now forecast that the eonomy may contract in the first two quarters of next year, and full year growth of 2.4 percent in 2009. My feeling is that these estimates may well be too high, and that the economy may well already be contracting in Q4 2008 (in fact Deputy Economy Minister Kelpach more or less admitted that this was the case in his earlier slip of the tongue), so we could easily see an outright GDP contraction in 2009 both in real terms and, much more seriously, in nominal terms (if we hit price deflation, everything depends on how fast the authorities let the ruble devalue). A contraction in nominal GDP would be very hard for the Russian authorities to handle - since we would be into using unconventional tools in an economy where policy managers have not yet learnt to satisfactorily use conventional ones. Month on month industrial output was down 10.8%. Unemployment is also rising, as are overdue wages, which were up 93% over the previous month. The unemployment rate rate rose to 6.6 percent in November, which is the highest since April, but still comparatively low by historic standards, although experts suggest we could easily see this number rise towards 10% to 11% in 2009. The total number of unemployed reached 5 million people, compared with 4.624 million in October, or 6.1 percent, according data from Rostat. 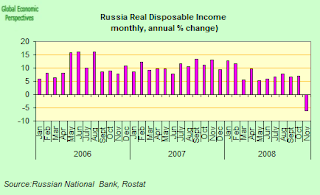 Wages, however, are still rising at this point, and the average monthly wage rose an annual 7.2 percent in November to 17,995 rubles, while real disposable income fell 6.2 percent. 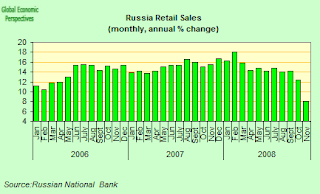 Russian retail sales also slowed in November and sales increased at an annual 8 percent, still quite strong, but down considerably from a revised 12.4 percent in October. Still this is the slowest pace of expansion since November 2003 and more significantly sales fell 3.4 percent from October. Retail sales have increased at an average annual rate of about 13 percent since 1998. However these have to a large extent been fuelled by unsustainable wage rises, and large scale consumer borrowing. 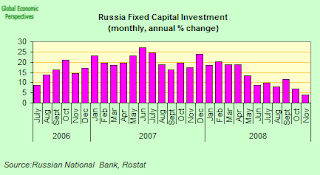 Loans to individuals rose 58 percent in 2007, reaching 2.97 trillion rubles ($110 billion) as of 1 January 2008. Capital investment has also been slowing, and growth was down to an annual 3.9 percent in November, the lowest rate since January 2005, according to the statistics office. Investments grew 6.9 percent in the previous month. Thus an incredible trifecta - a unilateral decision to recognise Georgia's two separatist regions, a 66 percent fall in oil prices and the worst global financial crisis since the Great Depression - has concocted itself, and has lead to a sharp spike in investor unease which has provoked the withdraw of around $211 billion from Russia (estimate by analysts at PNB Paribas) since that fateful day when the tanks went though roaring through the Roki tunnel, and we now await to see just how sharp "sharp" means when we are talking about the slowdown in Russian GDP in 2009.